"A slight twist on the traditional tuna melt. Lemon zest, lemon juice, and fresh dill add a nice zing to a classic favorite." Set oven rack about 6 inches from the heat source and preheat the oven's broiler. Arrange bread in a single layer on a baking sheet. Toast bread lightly on both sides in preheated oven, about 1 minute per side. Mix tuna, mayonnaise, lemon juice, lemon zest, and dill in a bowl. Spread tuna mixture evenly over each slice of bread. 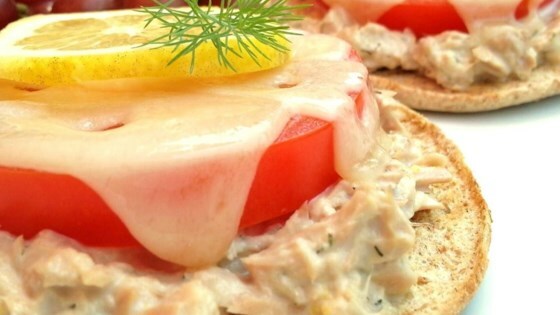 Arrange tomato slices over tuna mixture and top with Swiss cheese. Return baking sheet to oven and broil until cheese is melted, 3 to 5 minutes more. Watch Chef John make the world’s tastiest tuna melt. Skinnied this up with greek yoghurt and used cheddar for the kiddos. These are fantastic tuna melts! Making round two tonight. When made as directed this just doesn't taste very good. The cheese was unusually dry after baking and the juice and dill completely overpower the tuna flavor. It made for a disappointing meal.